Acroprint TimeQ Plus Biometric Fingerprint Time Clock System. 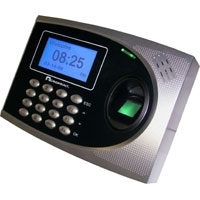 Includes 125 Employee TimeQ Plus Software and the TimeQ Plus Fingerprint Time Clock Terminal. Eliminate the need for time cards with the Acroprint TimeQ Plus biometric time clock. Using only their fingerprints, employees can clock in easily and quickly. You’ll also eliminate buddy punching by employing a fingerprint time clock. By automatically totaling employee hours and easily exporting data to your payroll software, this biometric Acroprint time clock system is an excellent solution for any small business. TimeQ Plus can also grow with your business. You can expand your system to accommodate 250 employees. Order your fingerprint time clock today at TimeClockeShop.com. Acroprint TimeQ Plus Biometric Time Clock System... Eliminates the need for time cards, employees just place their finger on the clock terminal to Punch In or Out. As an alternative, some employees can be setup for PIN Entry mode, which simply requires a PIN Number to be entered via the keypad to punch. The Biometric Time Tracking Prescription for your small businesses!! 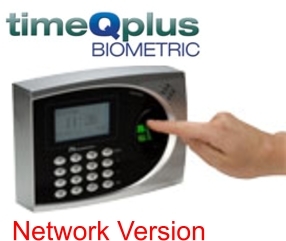 TimeQ Plus Biometric Time Clock includes...(1) TimeQ Plus Fingerprint Clock Terminal, with USB Output Data Port (1) TimeQ Plus 125-Employee Software, (1) Serial (9 PIN D-Sub) Data Cable 5-foot and (1) USB 5-Foot Data Cable and (1) Ethernet 5-Foot Network Cable. 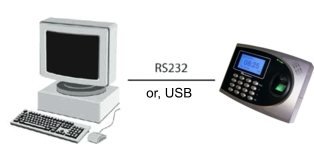 **USB Output Data Port: Easily download Employee Punch data to your supplied USB Flash Stick. Poll this data into the TimeQ Plus Software at another location. 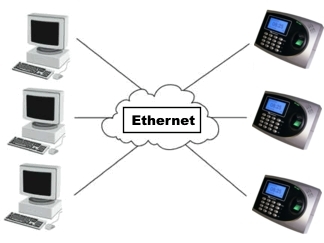 Remember: Each TimeQ Plus Fingerprint Clock Terminal comes standard with Ethernet Connectivity, making it easy to add additional Fingerprint Time Clocks throughout your on-site Facility or remote facilities.